#CHILLIN: Buffered by parked cars, #PopUpChandler cycletrack users enjoy their morning coffee on the way to CicLAvia! Thank you for stopping by, Los Angeles! Over 1,000 of you rolled through the #PopUpChandler cycletrack yesterday! 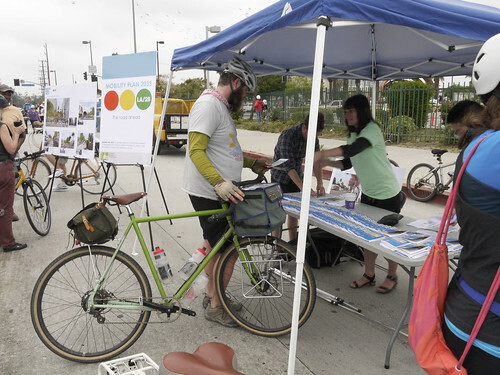 In case you missed it, the City hosted a pop up demonstration cycletrack at Sunday’s CicLAvia – The Valley. 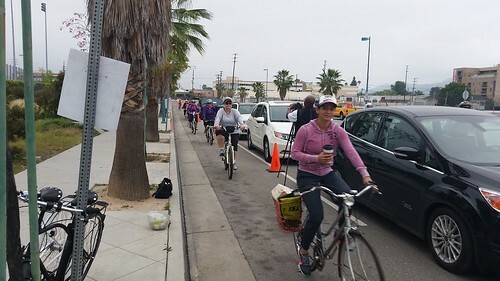 The one-day installation was a collaborative effort by LADOT and the Department of City Planning to create a temportary cycletrack as a means to bridge the network connection between the Chandler Bike Path and the CicLAvia NoHo Hub. #PopUpChandler, located between Vineland and Fair, gave participants an opportunity to see and experience the low-stress bicycle facilities proposed in the City’s draft Mobility Plan 2035, hands-on and in-person. Throughout the day, people of all ages rolled through the cycletrack, protected by a row of parked cars, on their way to the CicLAvia North Hollywood Arts District Hub. CicLAvia event participants were encouraged to travel through the pop up and pit stop at the City of LA booth prior to continuing on to the day’s festivities. 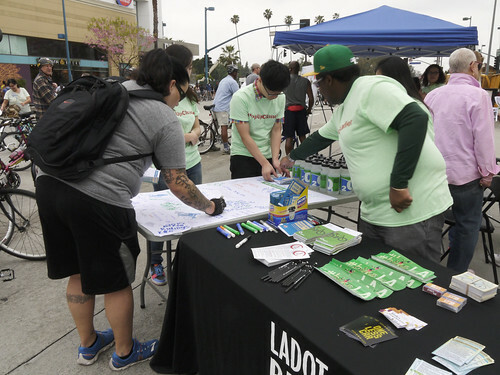 Upon exiting the cycletrack, users were able to directly engage with the City’s mobility planners and active transportation engineers to discuss the nuances of the protected lanes and learn more about different ways to confiure streets for all types of users. Residents from the Valley and beyond noted the added comfort and safety of the cycletrack concept, especially for the youngest and most vulnerable: children on bicycles. Passerbys noted that “flipping the bike and parking lane just makes sense and seems safer for everyone.” Many provided City staff with feedback and shared their experience on social media using the hashtag #PopUpChandler. City staff were joined by USC Price School externs to perfom cycletrack outreach, collecting surveys, feedback and answering questions. Unlike the traditional planning process, pop up events allow community members to experience infrastructure and provide input based on that experience. The temporary “pop up” design utilized traffic cones to designate space for people on bicycles, people parking cars, and people driving cars. In this cycletrack design, the parking lane has been flipped with the bike lane, maintaining street parking, while adding extra protection and reducing conflicts between people travelling on bikes and people travelling in cars. This configuration is simple and provides benefits to all users. Beyond serving those travelling by bicycle or car, cycletracks create shorter crossing distances for people walking. CicLAvia attendees enjoy the low-stress nature of the Chandler demonstration cycletrack connecting their journey from the Chandler Bike Path to the event hub. 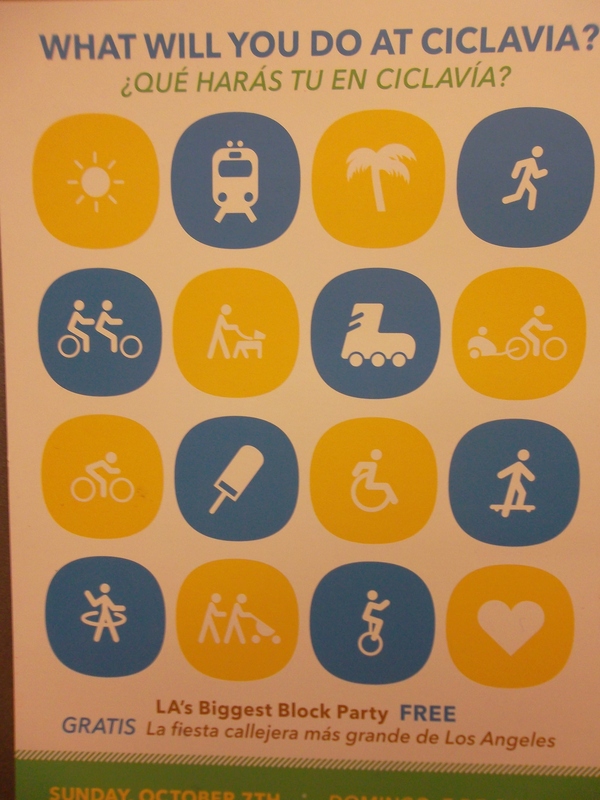 Sunday’s event is just the first step toward safer and more comfortable mobility network. Cycletracks are an important element in the City’s draft 2035 Mobility Plan, which emphasizes low-stress facilities as an important active transportation mode that helps to reduce vehicle miles traveled throughout the city, as well other associated environmental benefits. The 2035 Mobility Plan is scheduled to be before the City Planning Commission in May, and you can find out more at an open house on Tuesday, March 24. Protected bike lanes are similarly included in LADOT’s Strategic Plan “Great Streets for Los Angeles“. Keep an eye out for similar pop-up events in the future that will help us better plan and design more permanent bicycle infrastructure in your neighborhood! Today marks a very exciting step forward in our continuing effort to implement more cycletracks in Los Angeles. 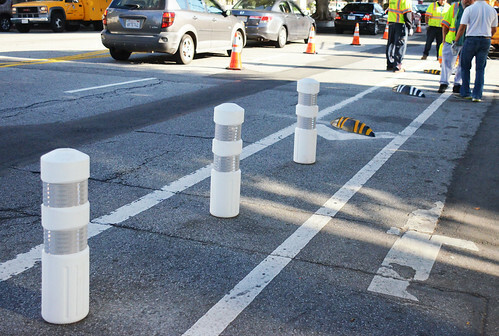 From 12-2pm this afternoon, we tested various cycletrack physical barrier options including armadillos and K71 bollards. 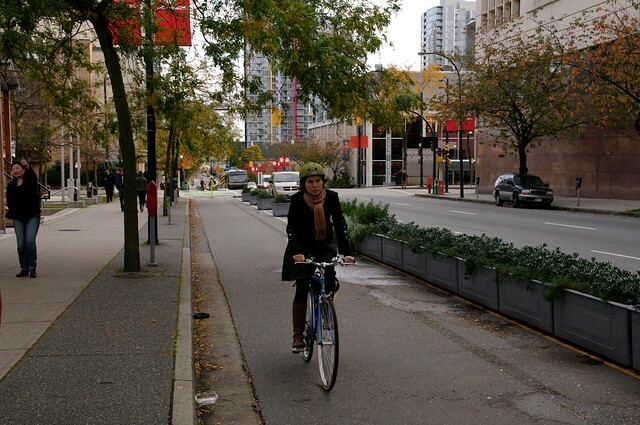 As a refresher, cycletracks, also known as protected bicycle lanes, are on street lanes that separate people on bicycles from motorized traffic by physical barriers such as curbs, planters, parked cars, and posts. They are a relatively new infrastructure that has become more and more popular around the nation. K71 bollards and armadillos in the buffer zone await bicycles, a sedan, a truck, and the ultimate test: the LAFD fire truck! 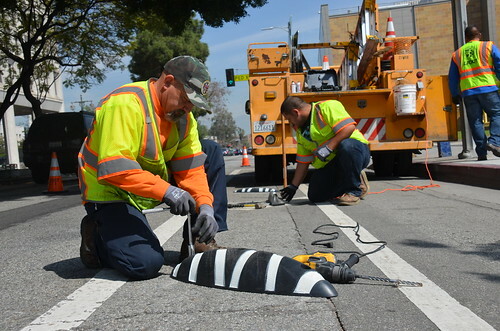 Starting at 9 am, LADOT crews began installation of the cycletrack test materials. The installation served as a test for all road users, seeking to understand the various interactions the different types of barriers will face in their everyday contexts. 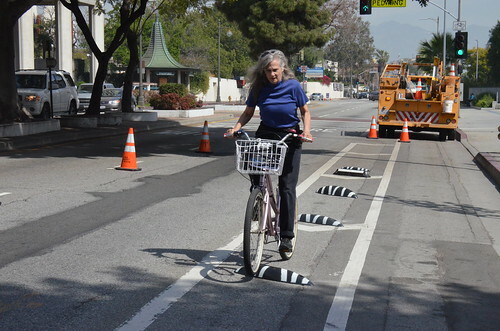 Around noon, City employees, Mayor’s Office staff, folks from LACBC and the City of LA Bicycle Advisory Committee helped test the barriers with their bicycles, observing their perception of separation as well as the mountability of the materials. On Sunday, March 22, CicLAvia is coming to the Valley from 9 am – 4 pm. Adjacent to the North Hollywood Arts District Hub, the City will host “Pop-Up Chandler Cycletrack,” a one-day, “pop-up” protected bicycle lane demonstration. The Chandler Cycletrack will be temporarily installed on Chandler Boulevard between Vineland Avenue and Fair Avenue. The pop-up will help visualize facilities proposed in the City’s draft Mobility Plan 2035 to create low-stress bicycle networks that safely connect people to places. Roll through on your way to CicLAvia! Cycletracks, also known as Protected Bike Lanes, are bike lanes that physically separate bicycles and cars, increasing safety and comfort-levels for all road users. 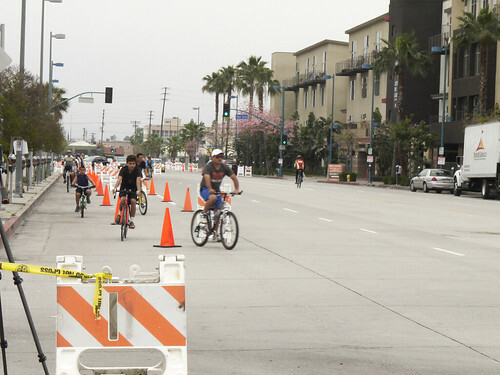 The pop-up event will feature one-way cycletracks on both sides of the street connecting the Chandler Bike Path to CicLAvia Lankershim Hub. Pop-up events give people an opportunity to see and evaluate public realm improvements during the planning process, hands-on. The pop-up technique is an incredibly useful tool in that it helps residents visualize the scale and appearance of potential improvements. While descriptions, mock-ups, and pictures help, first-hand experience can give people a fresh perspective that may be difficult to replicate through any other means. Pop-up projects are comparatively low-cost and low-risk. Projects can last one day or longer, and they are easy to install and remove. Because not everyone has seen a protected bikeway, much less experienced the level of safety these facilities provide, this temporary reconfiguration can provide a venue to re-imagine Los Angeles as a safer more comfortable place to travel by any mode. The intent of this project is to be immediate, educational, and informative for the public and practitioners alike. It turns a standard public workshop into a real event for the community to interact with. It is more participatory than the traditional planning process, as community members are able to directly provide input, and impact future design and planning decisions in their neighborhood. The physical separation provided by a protected bike lane makes people feel better about making trips on bikes. It opens up the street to people of all ages, and makes bicycling low stress. Additionally, the road-diet helps to decrease the speed of motor vehicles. Protected lanes are especially great for families with young children; parents can have peace of mind knowing that their child can safely and comfortably ride their bicycle in their neighborhood. Ultimately, the hope is that people with all levels of biking experience who test out the pop-up lane will feel safer and more comfortable riding their bicycles, and thus support the introduction of this type of permanent bicycle infrastructure in their neighborhood. Where else has this occurred? A one-day, pop-up cycle track was created on Telegraph Avenue in Oakland, CA last spring. 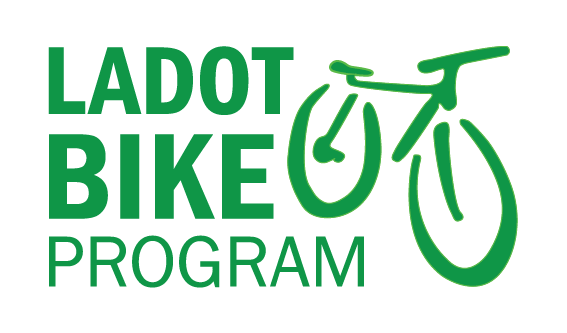 During the event, one participant commented: “it’s amazing to bike on Telegraph Avenue and feel so safe. I wish it was like this all the time.” To provide physical separation from vehicles, volunteers placed planters, and decorated boxes along a freshly painted line. This past December, the Oakland City Council voted unanimously to approve parking-protected bike lanes for Telegraph Avenue. Oakland brought conceptual designs from paper to the street, where the positive feedback provided by the community directly contributed to the measure being passed. 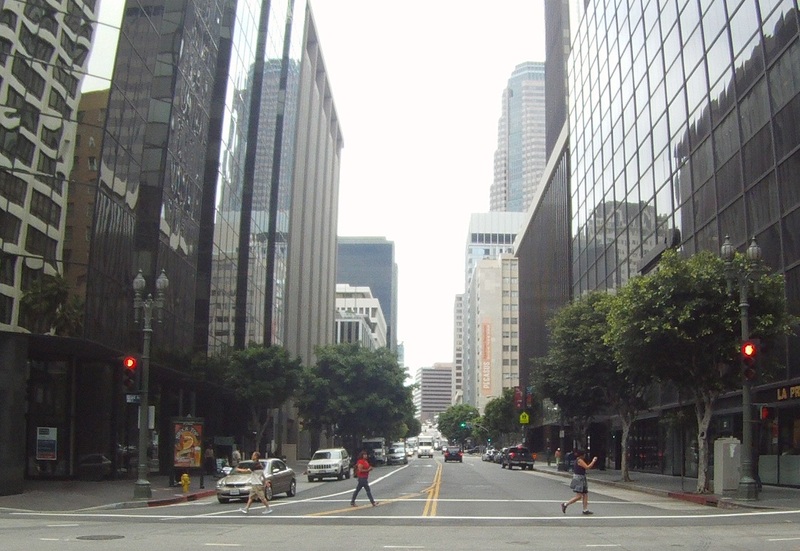 Other notable placemaking events include, Santa Monica’s Michigan Avenue Neighborhood Greenway Project (MANGo), the pedestrianization of New York City’s Time Square, as well as the placement of plazas and parklets in the streets of Los Angeles. These cities have been able to successfully encourage bicycling and build support for infrastructural improvements through these temporary installations that demonstrate what actual changes can look and feel like. Los Angeles is changing the way it thinks about safety. Under LADOT’s policy initiative Vision Zero, the city is making great strides towards eliminating traffic fatalities. As part of this effort to increase safety for all road users, LADOT has included protected bike lanes in its toolbox of options. Additionally, protected bicycle facilities are consistent with the long-term framework provided in the 2035 Mobility Plan, which emphasizes active modes of transportation, reducing vehicle miles traveled, low-stress facilities, and associated environmental benefits. The Mobility Plan recognizes protected bicycle lanes as an integral part of the Bicycle Enhanced Network, and details the benefits mentioned in the paragraphs above. Specifically, the plan sites enhanced bicycle infrastructure as a key element in making seamless connections from walking and biking to transit. Participants are encouraged to document and share their experiences with staff during the event, as well as to post on social media websites throughout the event using the hashtag #PopUpChandler. 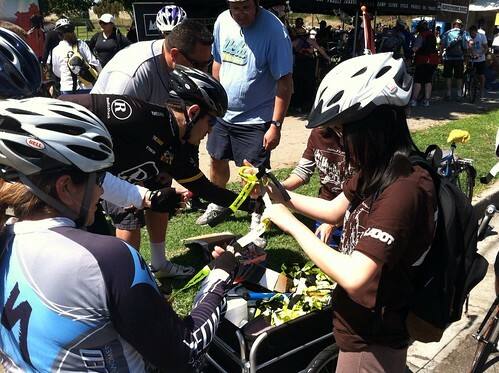 Quick update: LA2B did a great post about next week’s CicLAvia, as well. Check it out! The Hours Are Long – Previous CicLAvia’s have been held from 10am to 3pm but this one will be two hours longer, from 9am to 4pm (that means more time for walking and running). It Is Rail Accessible – The Red, Blue, Expo, and Purple Lines all have stops along the route so getting there by transit, or some multi-modal combination, will be a relatively easy. The Route Is Short – At six miles long, one can easily enjoy much of the route through a leisure walk. In honor of Earth Day, the Mayor’s Office has put together a series of videos titled “LA’s Green Secrets”. Their first video features everyone’s favorite block party: CicLAvia! Check out the above video, and stay tuned to the Mayor’s Office YouTube channel for more videos showing “green” things to discover in the City of Los Angeles. Next Sunday, October 7, from 10am to 3pm, come celebrate LA’s fifth edition of CicLAvia! CicLAvia opens the streets for people to freely walk, skate, play, ride a bike, or ?, by making selected city streets vehicle-free for the day. As always, CicLAvia will also offer a wide variety of programmed activities for people of all interests and ages, including music, performances, food trucks, and more. Shop owners and restaurants along the 10-mile route are encouraged to open their doors to people along the CicLAvia route (possibly with some special deals?). The event is not a race, as there is no “start” or “finish;” the streets simply operate as a platform allowing participants to enjoy the space as they see fit.